Our templates are delivered in zip format, containing multiple files. Most operating systems now offer built-in file extractor utility but you can make use of external unzip software such as WinRar, 7zip or such. The Zip file contains a documentation with detailed instructions and any font requirements for you to start making your invoice. Fonts are free to download using the links included in the instructions. Can I resell the templates? Reselling templates is strictly prohibited. All our templates are for personal and business use only. Business use means that you are allowed to issue our invoices to your clients but not to resell or transfer the template. Refer to our licensing page for more information. What is the invoice template size? All our templates follow the standard US letter format. The exact size is 8.5 x 11 inches. What’s the best way to share Freenvoices to my friends or colleagues? Please share Freenvoices on your social media platforms using our Facebook and Twitter buttons. 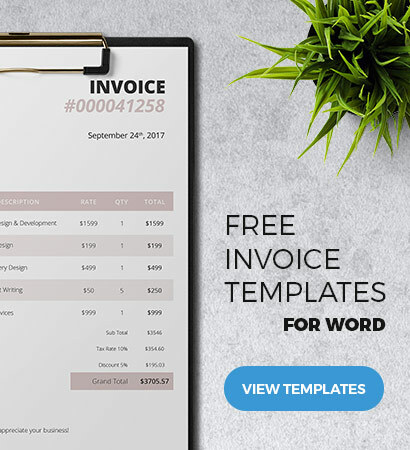 Spread the word about the free and modern invoice templates that we offer. Thank you for your support and helping keep our services free for everyone.